(Reuters) - A week ago, Lebanon was without a government and facing the prospect of an even deeper crisis come May, when President Michel Suleiman's term was set to expire with no agreement on his replacement. But in a matter of days, a degree of hope has returned to the politics of a country plunged into crisis by the war in neighboring Syria. Lebanon has a government after nearly a year without one, fuelling hope that a new president will follow. Amin Gemayel, president for six years during Lebanon's own 1975-90 civil war, attributed the breakthrough to fears the state might be on the verge of total collapse, and "regional understandings" - Lebanese parlance for a greenlight from states that wield influence here, particularly Saudi Arabia and Iran. "After the formation of this government, and the way it has been formed, there is a greater degree of optimism," Gemayel said in an interview at his 16th century ancestral home in Bikfaya, a Christian town in the mountains northeast of Beirut. "We know that this consensus is delicate and fragile, therefore we are working hard to strengthen this minimum degree that has been achieved, and to turn it into something more stable and long-lasting," said the head of Christian party Kataeb, which has three ministers in the new cabinet. "Electing a president is a fundamental element," he added. Prime Minister Tammam Salam finally managed to pull his government together after 11 months on Saturday, grouping politicians from across a political spectrum divided by theSyria war and other conflicts that predate it. They include Shi'ite Hezbollah, an ally of Syrian President Bashar al-Assad and Iran, and the Future Movement of heavyweight Sunni politician Saad al-Hariri, an ally of Saudi Arabia - one of the main sponsors of the Syrian opposition. The government convened for the first time on Tuesday. Lebanon's parliament must now elect a new president by the end of May. The vote requires a two-thirds quorum. But parliament has also fallen victim to the political crisis. It has not convened since last May, when it extended its term after a failure to agree on a new election law. Gemayel, part of the Hariri-led March 14 alliance, said a presidential election would help revive state institutions hit by paralysis. "There is no presidential election in Lebanon without a minimum degree of consensus," he said. "It is a difficult mission, but not an impossible one." Asked if he had a preferred candidate for the post, reserved for a Maronite Christian according to Lebanon's sectarian power-sharing system, Gemayel said it was too early to discuss names. The new government faces challenges including a massive influx of Syrian refugees and a security risk posed by radical Sunni Islamist militants sympathetic to the anti-Assad rebellion and responsible for recent bombings in Hezbollah areas. Political sources say the government would not have come to pass without the approval of both Iran and Saudi Arabia - states whose rivalry has fuelled conflict across the Middle East in countries including Syria, Iraq and Lebanon. It signals a decision by both states to shield Lebanon from further repercussions of the Syria conflict, they say. 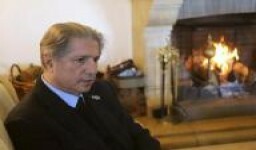 Gemayel said Iran appeared set on improving relations with Saudi Arabia, which in turn might be ready to normalize ties with Tehran pending resolution of their regional disputes. He heaped criticism on Hezbollah for fighting alongside Assad's forces in Syria, saying it had brought violent repercussions to Lebanon in the form of militant attacks. But he also praised Hezbollah leader Sayyed Hassan Nasrallah for saying that it was up to the Lebanese state to confront the domestic security challenge. Security forces last week managed to apprehend a man described as the al Qaeda-linked mastermind of a recent string of car bomb attacks. Gemayel attributed the success to a unity of purpose among Lebanese on fighting such militancy. Hariri vowed to combat Sunni radicalism last week in what Gemayel described as a courageous speech. Lumping together the political breakthrough with the security forces' achievements, Gemayel said: "All of this makes me more optimistic that Lebanon will be able to pass through this test, and that Lebanese leaders reach the hoped-for consensus, even at a minimum level." "At the very least, we will have preserved Lebanon."